Palladium would seem to be a commodity traders dream – high demand with multiple and seemingly ever-expanding uses but relatively low stocks which ensure that demand is not fully met keeping prices high and trading fresh. Palladium is found in four geographic regions, Norilsk in Russia, South Africa’s Transvaal province, Montana in the USA and in Ontario, Canada – areas diverse enough that political tension in one area will not be able to fully disrupt the flow of supply. In appearance it is a silver-white lustrous metal, of low toxicity and strongly resistant to corrosion. It is, like many metals, a conductor of both heat and electricity. It is also both ductile and malleable, meaning it can be shaped as required, even beaten into thin leaf or pulled into a wire, broadening the scope of its uses even further. It is thirty times rarer than gold. 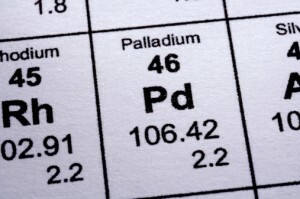 Discovered by William Hyde Wollaston (also the discoverer of rhodium) in 1803, palladium is the least dense of the Platinum Group Metals (PGM) – a group of metals with similar chemical properties such as platinum, osmium and rhodium amongst others – and also has the lowest melting point. 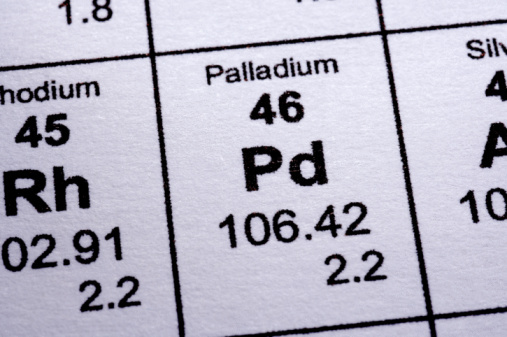 There are many uses for palladium, from jewellery to manufacturing processes to a whispered importance in the theoretical production of cold fusion – the Holy Grail of energy scientists. Palladium is alloyed with gold to create the popular white gold, a favourite metal for wedding bands, adding a hard wearing durability. It has been used prominently in the jewellery trade since 1939. Its main current industrial use is in the catalytic converters that are making vehicles ever ‘greener’ by transforming harmful chemicals into safer, more environmentally friendly ones. One source of palladium is in fact the recycling of these catalytic converters once the vehicles are ready for scrap. Palladium is also alloyed to make electrical contacts due to its splendid conductive properties. One of palladiums most important qualities is its ability to absorb up to 900 times its own weight in hydrogen. This allows it to work as a purifier for hydrogen for use in chemical processes and so on. Palladium also has a huge future role; a new type of very long life battery is currently in testing. These batteries would power laptops, mobile phones and cameras – the must-have items of this technological age. The trading history of palladium shows a series of peaks and troughs, the dips during times of global financial strife or unrest in one of the countries that produce the mineral, some of the price spikes following the general supply/ demand trends others occurring at significant periods, for example December 1999 in particular showed a notable increase. Just recently palladium took a small tumble due to problems experienced in the South African mining industry. Overall, while all due attention must be paid to the state of the global economy, palladium is certainly a commodity to keep in mind when trading; it would seem that scientists, jewellers and inventers alike cannot get enough of this rare, useful metal. >> Read more about other valuable metals to trade here.